We’d love your help. Let us know what’s wrong with this preview of Some Places More Than Others by Renée Watson. Newbery Honor author Renée Watson explores a family’s relationships and Harlem—its history, culture, arts, and people. All Amara wants is to visit her father's family in Harlem. Her wish comes true when her dad decides to bring her along on a business trip. She can't wait to finally meet her extended family and stay in the brownstone where her dad grew up. Plus, she wants t Newbery Honor author Renée Watson explores a family’s relationships and Harlem—its history, culture, arts, and people. All Amara wants is to visit her father's family in Harlem. Her wish comes true when her dad decides to bring her along on a business trip. She can't wait to finally meet her extended family and stay in the brownstone where her dad grew up. Plus, she wants to visit every landmark from the Apollo to Langston Hughes's home. But her family, and even the city, is not quite what Amara thought. Her dad doesn’t speak to her grandpa, and the crowded streets can be suffocating as well as inspiring. 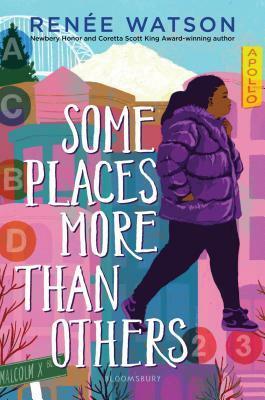 But as she learns more and more about Harlem—and her father’s history—Amara realizes how, in some ways more than others, she can connect with this other home and family. To ask other readers questions about Some Places More Than Others, please sign up. I ended up loving this book! It took me a little bit, but I really fell in love once Amara visited New York. I loved watching her meet her extended family and start to understand where her . dad came from. I think Watson did an excellent job bringing up the concept of establishing your own identity as a young adult and how that can conflict with your parents' identities. Although short, I think this book has a lot to discuss and would be a great conversation starter for my 6th graders. Amana yearns for who she is, in family and in culture. Unlike many books, Amana comes from a strong family and has many opportunities through her dad’s career. One one trip, she finds the deep rooted connection she felt but couldn’t find. The story is rich with pride of and for the history or the Harlem Renaissance.. Focusing on the so many positive aspects that have come from Harlem was refreshing and opened my eyes to some people I hadn’t heard of. It was a great read and one I can’t wait for Amana yearns for who she is, in family and in culture. Unlike many books, Amana comes from a strong family and has many opportunities through her dad’s career. One one trip, she finds the deep rooted connection she felt but couldn’t find. Renée’s one woman show, Roses are Red, Women are Blue, debuted at N Renée Watson is the author of the children’s picture book, A Place Where Hurricanes Happen (Random House, June 2010), which was featured on NBC Nightly News with Brian Williams. Her middle grade novel, What Momma Left Me debuted as the New Voice for 2010 in middle grade fiction by The Independent Children's Booksellers Association.